See more objects with the tag architects, architecture, home, personal environmental control, adornment, repetition, protection, stylized, rhythm, foliate, curving line, family, art nouveau, exterior, organic line, iron. This is a Balcony grille. It was designed by Hector Guimard. We acquired it in 2011. Its medium is cast iron. It is a part of the Product Design and Decorative Arts department. 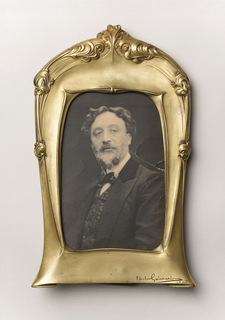 Hector Guimard is considered to be one of the most prominent innovators of the art nouveau style. 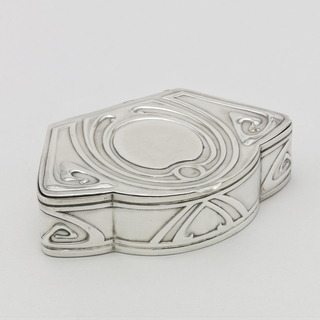 Guimard is perhaps best known as the designer of the iconic Paris Metro station metalwork. He designed myriad decorative objects from ceramics to furniture fitting within the Gesamtkunstwerk of the art nouveau interior. He also was active in architectural design and his work included interiors, private residences, and commercial buildings. 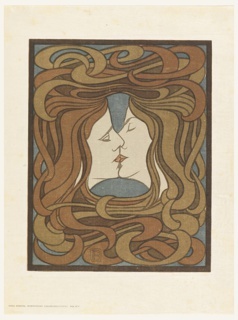 Guimard’s building facades echoed their inventive interior spaces with curving, sinuous forms and architectural elements that fit within the vocabulary of art nouveau. One such decorative element Guimard designed for building exteriors were balcony grilles, like the one proposed for acquisition. 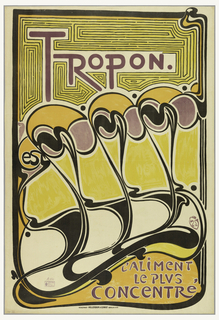 This design was used in multiple Guimard constructions, including an ensemble of buildings built between 1909 and 1911 (from which this example comes). The constructions include addresses in Paris at 17, 19, and 21 rue La Fontaine; the Trémois Building; Hôtel Mezzara; and the Villa at Eaubonne. From private French residences to small pre-fabricated Parisian apartments, such cast iron works were incorporated throughout several exterior schemes, emphasizing the variability of cast iron, both as a decorative material and early example of mass production. During the 1960s, tenants in Guimard-designed buildings were allowed to change and remove the architectural metalwork, such as these balcony grilles, leading to the dissemination of some of the examples. Those that remained can no longer be removed. 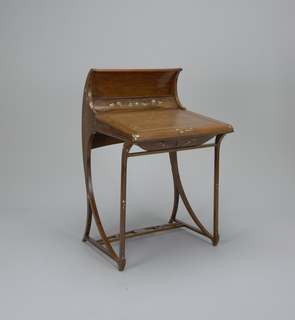 The manufacturer responsible for producing Guimard’s architectural metalwork was the Saint-Dizier foundry. 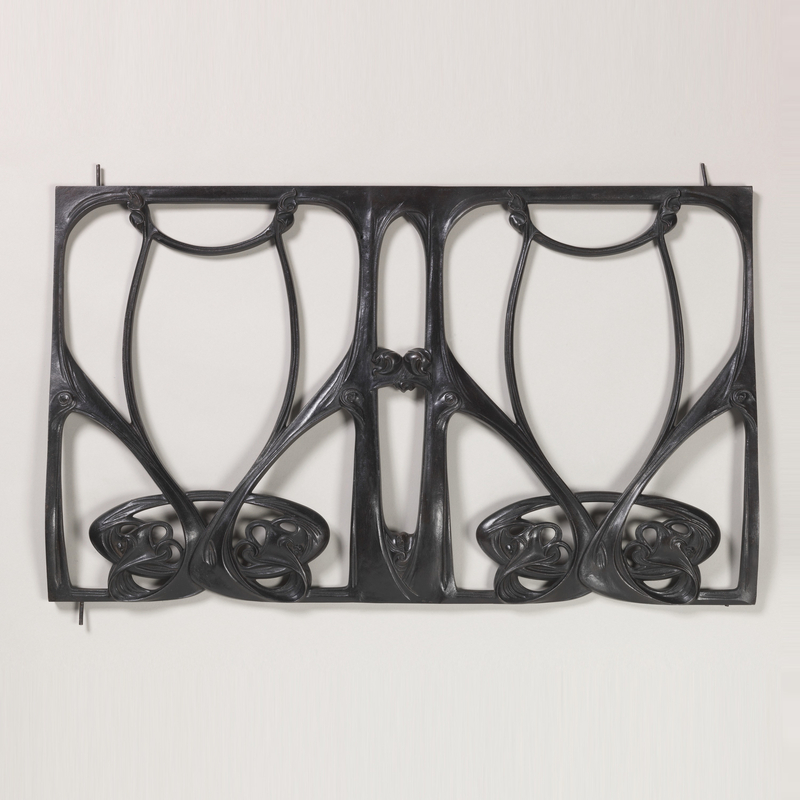 These grilles serve as an excellent example of a design and industry collaboration resulting in the dissemination of a style that has left a unique mark on the history of design, and has played an important role in early 20th-century visual culture. After Guimard’s death in 1942 in New York, his widow, Madame Guimard, gave several gifts of her late husband's work to the museum. The objects are from the first decade of the 20th century and include a chair, vases, frames, and a door bell pull. This acquisition will add a new dimension to the museum’s Guimard holdings, as it will be the first exterior architectural design work by Guimard in the collection. This object was purchased from Lillian Nassau. 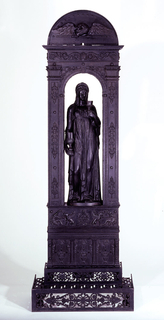 This object was previously on display as a part of the exhibitions	Hewitt Sisters Collect and Making Design.